Please allow two day's notice prior to booking online for preparation purposes. 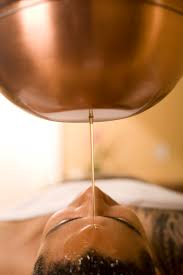 Shirodhara is an ancient Indian Ayurvedic "annointing of oil" treatment. A warm stream of oil (or other warm liquid depending on client) is administered to the forehead which creates complete relaxation and a sense of calm. Some Ayurvedic doctors describe the process as a method of rebooting the nervous system. Hearing, smelling and sight can become heightened during and after this profound treatment. I highly recommend a session for those dealing with migraines, anxiety, high stress levels, panic attacks, depression, insomnia and/or psoriasis of the scalp.